Here you are going to find details of the cheapest auto insurance carriers in Florida. Overall the least expensive are Florida Farm Bureau, USAA, and Travelers. Depending on the city you reside in and your age, each of the insurers are from 12% to 26% lower than the average premium. Other carriers to put on your list of quotes are Auto-Owners, State Farm, and The Hartford. Depending on your driver history, each carrier can offer quotes from 10% to 22% lower than the median quote for similar profile drivers. In many regions, Progressive and Direct General offered lower than average quotes. In this article, I am going to dive into the minimum requirements, inexpensive insurers by age, and strategies to help you get a lower premium to maximize your savings. Note: A 25 year old driver can find the cheapest premiums with Florida Farm Bureau, USAA, and Travelers. I queried each at $1,505, $1,533, and $1,554 respectfully per year. USAA is available to service members, former military, and their spouses. Other options are State Farm and Auto-Owners as illustrated. 1.3 Who has the Cheapest Auto Insurance in Florida? Bodily injury liability minimum for a single person is $10,0000 and up to $20,000 dollar if the passenger in the other vehicle is injured. Note: For a 30 year old the quotes clustered between $1,298 and $1,376. Florida Farm Bureau is the least expensive at $1,298 per year. Other good options are Travelers and State Farm. I queried each at $1,343 and $1,345 per year for full coverage. $10,000 of property damage liability is required to cover any physical damages to the other automobile, and other private and non-private property that’s damaged. Who has the Cheapest Auto Insurance in Florida? Below is a table list of 21 of the most affordable carriers from 25 to 55 years of age. The least expensive carriers in Florida are FL Farm Bureau, USAA, Travelers, and State Farm. Florida Farm Bureau offers competitive quotes 31% lower than the state average. USAA is competitive for all drivers through the age spectrum. With policy’s 28% lower than average. However only former military, spouses, or children of former military are able to get a policy through them. Travelers offers quotes 26% lower than the “mean” rate in Florida. State Farm offers quotes 25% lower than the average premium. Two insurers offering low quotes in many metro areas are Progressive and Direct General. Depending on the area you reside, each carrier can offer quotes from 9% to nearly 19% lower than the median rate. Since Florida is a “no-fault” state they require drivers to carry Personal Injury Protection or (PIP) insurance. PIP coverage is going to cover the costs of doctor bills or the loss of wages from not being able to work. As with other states there are exceptions to the rule for PIP coverage. If the amount of damages or medical costs are exorbitant the other party is able to bring the “at-fault” driver to court for the financial loss. To find the best insurers by consumer rating is pretty easy. Included in the table below is the market share of each and the amount of written premiums. Of course, top insurers, such as GEICO, State Farm, Progressive, and Allstate will have more complaints. This is to be expected and you shouldn’t be alarmed. Included is the approximate rate change over an 18 month period. This is normal for most insurers. With the table you are able to find the carriers which have the best consumer rating. Typically the larger carriers will have a better consumer rating. However, if you are going for price only, at times you can find a lower premium with companies such as Florida Farm Bureau, Bristol West, or Infinity Auto. The consumer rating averages are from JD Power & Associates and any of the sources used below. Florida has a high uninsured motorist rate. It would be a good idea to consider uninsured motorist coverage in the unlikely event you are in an accident with a driver who does not have adequate coverage to cover expenses. Note: A 35 year old driver should find quotes clustering around $1,000 to $1,100 per year. When I queried for quotes the overall cheapest carriers are Florida Farm Bureau, USAA, and Travelers. I queried each at $978, $995, and $1,032 per year. Which is approximately 31% to 36% lower than the median quote. Florida is another state with an extremely high amount of uninsured drivers in cities with high population such as Miami, Jacksonville, Tampa, Orlando, and Pensacola. Not only state residents, but also those who travel to the state. Note: A 40 year old driver can find the best options with Farm Bureau, State Farm, and Auto-Owners. I queried each at $812, $838, and $837 respectfully per year. Which is over 30% lower than the median quote for similar age drivers. Comprehensive and collision cover is recommended by the state particularly if you have a newer vehicle. Comprehensive is going to protect your vehicle in all “non-collision” type of accidents. Comprehensive is also known as “non-collision” coverage. Collision coverage will protect the vehicle if you have an accident with a road sign or another non-vehicular object. Note: A 45 year old driver with a decent driving record should be able to get quotes below $700. The least expensive insurers are Travelers, Farm Bureau, and State Farm. I queried each at $649, $654, and $666 per year for full coverage. Or nearly 30% lower than the average premium. I decided to put statistics and data for a DUI. If you want to keep your premium as low as possible do not get a DUI in Florida. The prevalence of DUI’s in the state is higher than the national average. The average cost is approximately $8,000 and adds $6,500 to your annual premium for the next three years. If you are traveling to Florida you would want to tell your insurance company since many drivers go to the state via their own car. You may want to consult with your insurance broker to be sure you are adequately protected. Note: An older driver can find low quotes with Florida Farm Bureau, State Farm, and Auto-Owners. All three carriers are nearly 39% lower than the average premium for 55 year old drivers. Below is a table list of the average quote by city. The average insurance premium in Florida is approximately $1,200 per year. Included in the table is the percentage amount above or below the average premium. One thing you will notice is the big variance in premium cost from city to city. If, perhaps, you move you may see an increase (or decrease) in your premium. Your location will make a significant impact on your auto premium in Florida. If you want a quote comparison of larger cities please see further below. If you are looking for cheaper auto insurance in Jacksonville then start by getting quotes from FL Farm Bureau, State Farm, and Travelers. I queried each at $1,176, $1,332, and $1,388 respectfully for a 30 year old driver. Farm Bureau is 16% lower than the “mean” quote in Jacksonville. State Farm is 11% lower while Travelers is 10%. For a 45 year old driver the cheapest quotes are with Florida Farm Bureau which I queried at $632 for full coverage. Or 17% lower than the citywide premium. A 55 year old can find the low quotes with Farm Bureau at $367. Or 26% lower than the average premium rate. State Farm and Travelers are slightly higher with quotes at $489 and $538 respectfully. Jacksonville is named after Andrew Jackson was incorporated in 1832 and had less than 1,000 residents in 1845. Today, Jacksonville has over 900,000 residents and nearly 1.7 million people in the metropolitan area. Jacksonville has many bars, restaurants and entertainment venues at Atlantic and Jacksonville Beach. If you want savings on your auto premium in Miami then get quotes from FL Farm Bureau, Travelers, and State Farm. I queried each at $1,244, $1,476, and $1,587 respectfully for a 30 year old driver. Farm Bureau is nearly 50% lower than the citywide average premium of $2,455. While Travelers and State Farm are 45% and 40% respectfully. A 45 year old can find inexpensive quotes with Farm Bureau which I queried at $795 or 48% lower than the citywide average for a driver with a similar profile. Travelers was queried at $859 and State Farm at $1,055. A 55 year old can find low-cost quotes with Farm Bureau, Travelers, and State Farm. Each queried at $587, $673, and $745 respectfully for full coverage. Farm Bureau is 47% lower than the citywide premium. While Travelers is 41% lower and State Farm is 38% lower. Miami is located on Biscayne Bay in southeastern part of the state with a population of 460,000 residents. The metropolitan area, which includes Miami Beach and Ft. Lauderdale, has over 5.5 million people. Making it the 4th largest urban area in the U.S. If you want a lower premium in Tampa then get quotes from Florida Farm Bureau, Travelers, and State Farm. I queried each at $1,132, $1,265, and $1,487 respectfully for a 30 year old driver. Farm Bureau is 42% lower than the citywide average premium of $1,965. While Travelers and State Farm at 39% and 35% lower than the “mean” rate. A 45 year old can find low quotes with Farm Bureau, Travelers, and State Farm. Each queried at $737, $780, and $950 for full coverage. Or approximately 39% to 44% lower than the citywide premium. A 55 year old can find low quotes with Farm Bureau at $511. Which is 45% lower than the “mean” premium with in Tampa. Travelers and State Farm I queried at $587 and $689. Which is more than 38% lower than the average rate. Tampa was incorporated as city in 1849 with less than 1,000 residents. Today, it has a population of nearly 400,000 with 3 million people in the metropolitan area. It is multi-cultural city with a large Hispanic influence with more than 15% of the population Hispanic. Finding the cheapest car insurance in Orlando is easy if you get quotes from Florida Farm Bureau, Travelers, and State Farm. I queried each at $1,122, $1,209, and $1,346 for a 30 year old driver with full coverage. Which is 22% to 27% lower than the citywide “mean” rate in Orlando. A 45 year old can get a lower premium with FL Farm Bureau, Travelers, and State Farm. Each queried at $711, $743, and $862 respectfully. Or approximately 20 to 27% lower than the average premium. A 55 year old can find the cheapest quotes with Farm Bureau at $490. Or approximately 22% lower than the mean premium. Travelers and State Farm are competitive with quotes at $525 and $578 respectfully. Orlando was incorporated in 1875 with less than 100 inhabitants. Today, the city boasts more than 275,000 residents with 2.4 million people in the metropolitan area. It is home world famous Walt Disney World Resort and other theme parks which draws hundreds of thousands visitors each year. The average policyholder in St. Petersburg pays over $1,600 per year for a policy. As illustrated, I found 5 carriers at least 10% lower than the “mean” rate. 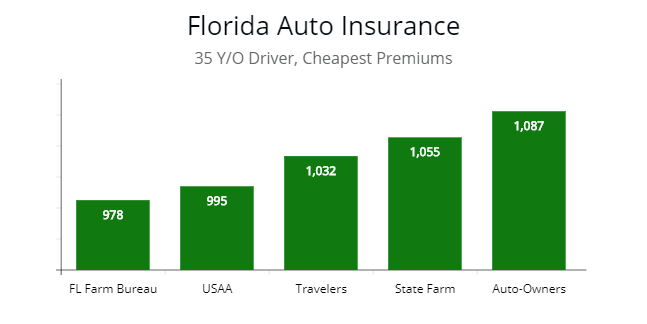 For a 30 year old driver the cheapest options are with Florida Farm Bureau, Travelers, and State Farm. Each queried at $1,108, $1,176, and $1,254 respectfully. Or 20% to 27% lower than the average premium. A 45 year old driver can find low rates with Farm Bureau, Travelers, and State Farm. I queried each at $709, $745, $789 respectfully for full coverage. For a 55 year old driver, I found the quotes clustering between $512 and $721. The best options are with Travelers and State Farm. Which is 23% lower than the citywide average of a driver with a similar profile. Allstate and Auto-Owners are 17% to 21% lower with quotes at $687 and $721 respectfully. St. Petersburg was incorporated as a town on February 29, 1892 and re-incorporated as a city on June 6, 1903. In 1903 there were less than 5,000 residents. Today, St. Petersburg has 260,000 residents and nearly 3 million including the Tampa Bay area. It is named after St. Petersburg, Russia. The average quote in Hialeah is over $2,400 per year. I found 5 carriers which are 25% lower clustering between $1,311 and $1,897. For the cheapest start by getting quotes from Florida Farm Bureau, State Farm, and Travelers. Each queried at $1,311, and $1,456, and $1,498 respectfully for a 30 year old driver. Which is 42% to 49% lower than the citywide average premium. A 45 year old can find cheaper quotes with FL Farm Bureau, State Farm, and Travelers. Each queried at $811, $887, and $954 for a driver with full coverage. Or 39% to 45% lower than the average premium. A 55 year old can find quotes clustering between $632 and $743. All five illustrated are at a minimum 20% lower than the citywide “mean” rate. Hialeah is the 6th largest city in the state. It was incorporated as as city in 1925 with approximately 2,500 residents. Today, it boasts more than 230,000 residents and 6 million in the metropolitan (Miami-Dade) area. Hialeah is 20 minutes northwest of Miami and has the highest percentage of Cuban and Cuban-American residents than any other city in the U.S.
Finding cheap auto insurance in Tallahassee is easy if you get quotes from Farm Bureau, Travelers, and State Farm. Each at $987, $1,055, and $1,094 respectfully for a 30 year old driver. Or approximately 9% to 15% lower than the citywide average premium of $1,487 per year. A 45 year old can find inexpensive quotes with Farm Bureau, Travelers, and State Farm. Each queried at $611, $658, and $674 for full coverage. Which is 9% to 12% lower than the citywide average premium. A 55 year old can supra-low quotes clustering between $390 and $569. The cheapest is Farm Bureau at $390 or 14% lower than the “mean” rate. Travelers is competitive with a quote at $411. While State Farm is 10% lower than average with a quote at $432. Home to Florida State University (FSU), Tallahassee was founded in 1821 with less than 1,500 residents. Today, it boasts nearly 200,000 residents with 380,000 people in the metropolitan area. Tallahassee is known for its large number of law firms, lobbying organizations, trade associations and professional associations. Drivers in Fort Lauderdale can find the cheapest quotes with FL Farm Bureau, Travelers, and Auto-Owners. I queried each at $1,098, $1,133, and $1,265 per year for a 30 year old. Which is 19% to 24% lower than the median quote for drivers of similar age and profile. All the carriers illustrated are over 10% cheaper than the median quote for a 30 year old. A 45 year old can get the best rates with Farm Bureau, Travelers, and Auto-Owners. Each queried at $655, $690, and $750 per year for full coverage. Or approximately 18% to 24% lower than the “mean” quote for similar age drivers. A 55 year old can find quotes clustering between $466 and $608. The least expensive are with Farm Bureau offering the lowest at $466. Both Travelers and Auto-Owners are competitive with quotes at $487 and $555 respectfully per year. Fort Lauderdale, known as Venice of America, was originally settled by Seminole Indians. New River Fort was built on the site of the current city in 1838 during the the Second Seminole War. Today, Fort Lauderdale is the principal city of the Miami metropolitan area with over 175,000 residing within the city. Drivers in Cape Coral are probably not getting the lowest rate because there aren’t looking in the right place. Start by getting quotes from FL Farm Bureau, Travelers, and Auto-Owners. I queried each at $980, $1,065, and $1,155 per year for a 30 year old. Which is 18% to 23% lower than the average quotes for drivers of similar age and profile. A 45 year old can get the best prices with Farm Bureau and Travelers. Each queried at $630 and $655 respectfully per year for full coverage. Which is 22% cheaper than the “mean” rate for other drivers in Cape Coral. Quotes clustered between $630 and $765 which is a $135 variance or nearly 25% price difference among the lowest and highest carriers making it important to compare quotes. For a 55 year old the best options are with Farm Bureau and Travelers. Both carriers offered quotes at $439 and $465 which is approximately 23% lower than the median quote for drivers of similar age and profile. Auto-Owners and State Farm are competitive with cheap quotes at $500 and $523 respectfully per year. Cape Coral is known as the “Waterfront Wonderland” with more miles of canals than any other city in the world. It was founded in 1957 as a planned community by the Rosen Brothers. Then incorporated as a city in 1970 with approximately 10,000 people. Today, there are nearly 180,000 residents and this trend it expected to continue. Drivers in Pembroke Pines can get the cheapest insurance by getting quotes from FL Farm Bureau, Auto-Owners, and Travelers. I queried each at $1,044, $1,097, and $1,158 per year for a 30 year old driver. Which is 17% to 22% lower than the “mean” quote for driver of similar age and profile. For a 45 year old the best prices are with Farm Bureau, Auto-Owners, and Travelers. Each queried at $640, $659, and $680 respectfully per year for full coverage. Which is 16% to 20% cheaper then the median quote. There is a fairly small price variance of $125 making any of the carriers illustrated worth getting quotes from. A 55 year old with a good driving record should be able to get cheap quotes with Florida Farm Bureau. I queried them at $440 per year for full coverage. Which is 23% lower than the median rate for drivers of similar age and profile. Auto-Owners and Travelers are competitive with low quotes at $487 and $503 respectfully. Pembroke Pines is a community founded in 1960 with approximately 1,500 residents. Today, there are over 175,000 residents making it the 11th most populated city in the state. The town started as agricultural land occupied by dairy farms and grew after World War II as servicemen were retiring. I realize most people are busy and do not have the time to call every insurer to get the lowest rate possible. With our system you can find lower car insurance quotes from top insurance companies all in one place; you don’t have to look up the phone number; nor do you have to call if you don’t want to. Your insurance quotes can be delivered right to your email. If you want, you can ask to have the agent give you a call at a convenient time for you when you are comparing quotes.